Hi folks! This post is part of a series I'm covering on the ELF format. In this one I'm going to discuss the section headers and unpack how they work. I know its a super long list right? But is going to get a bunch more entries very soon. In this one I'm going to cover the rest of the fields I skipped in the first section, unpack how section headers work and I thought I'd drop a nice illustration of the format as well. Enjoy! 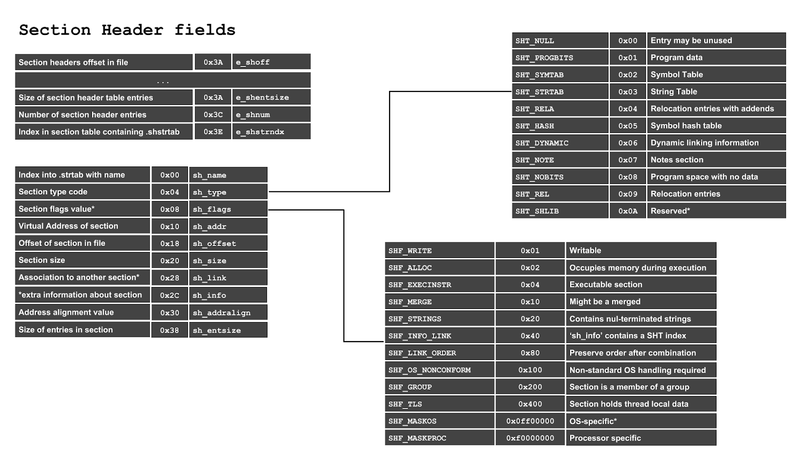 As you can see pretty boring stuff, there's also special fields for ARM and SPARC and should be for all the other architectures ELFs can run on (they just aren't as easy to find as an example as those two lol). This field holds the index of the.shstrtab, in the section header table. This section is merely an array of names for sections (used by readelf as well) providing some semantics for interpretation. This array is delimited by null values. As you can see, in the header value dump from readelf, the index number is listed as 28. 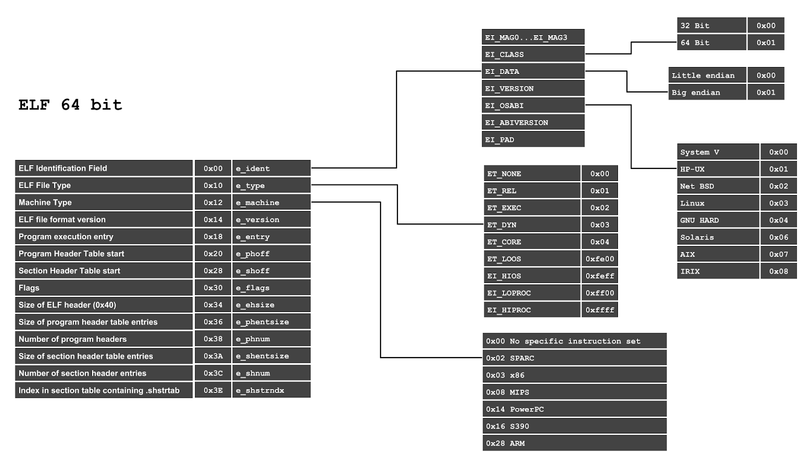 The next image shows a dump of the section header table also from readelf -S. We're focused in on entry 28 which is called the .shstrtab. 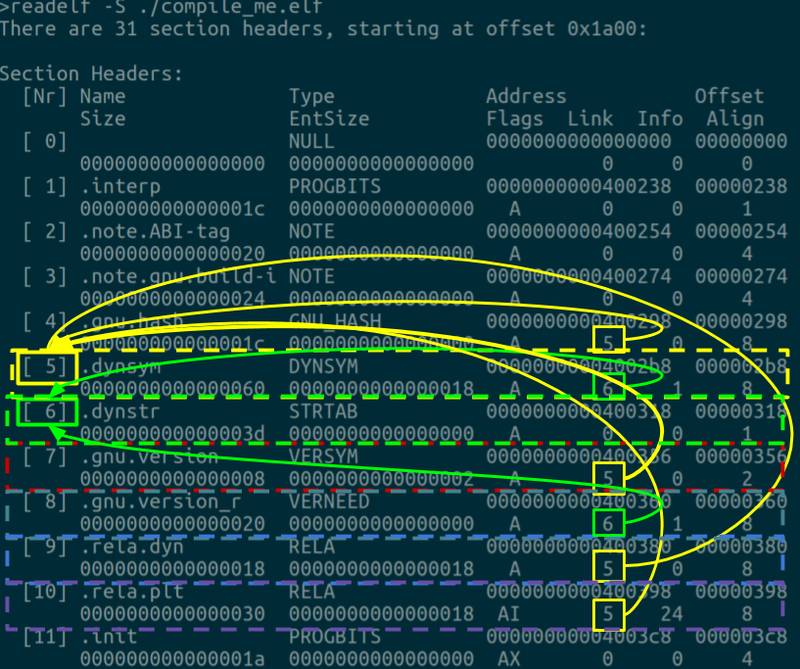 The last frame shows an honest hexdump of the file confirming these theories, offset 0x18f4 contains the start of the ascii data that programs like ld and readelf deference as the names of the sections. Okay that's the ELF header finally done and dusted. Lets check out how section headers work. 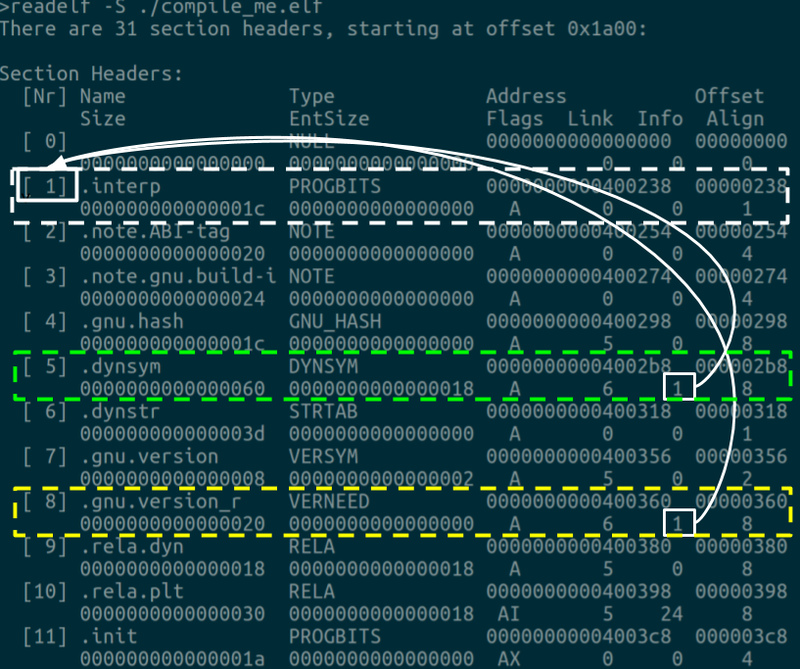 sh_entsize - the size of the entry in bytes. The sh_link field associates this section to another in order to provide important meta-data for its function. So for instance if a section requires a list of other strings to make sense of this field will contain the index of the section that contains that data. A good analogy would be if the section is about lets say a list of pokemon cards you might need a section to define pokemon card types or hold the name values for the cards in this case sh_link would point to the section that contains this data. So it allows sections to support one another in function. We can see examples of this in the functionality of sections like the .rela.plt or .dynsym (list of dynamic symbols and their properties) which probably needs to know where the dynamic symbol names are so therefore would contain some sh_link value that would prove helpful in this sense. Its no surprise the .dynsym points to the .interp section. .interp holds the path name of the interpreter. The interpreter is after all the program in charge of making sense of the symbol table and function relocation. As you can see the .shstrtab really is used to deference the names of the sections. 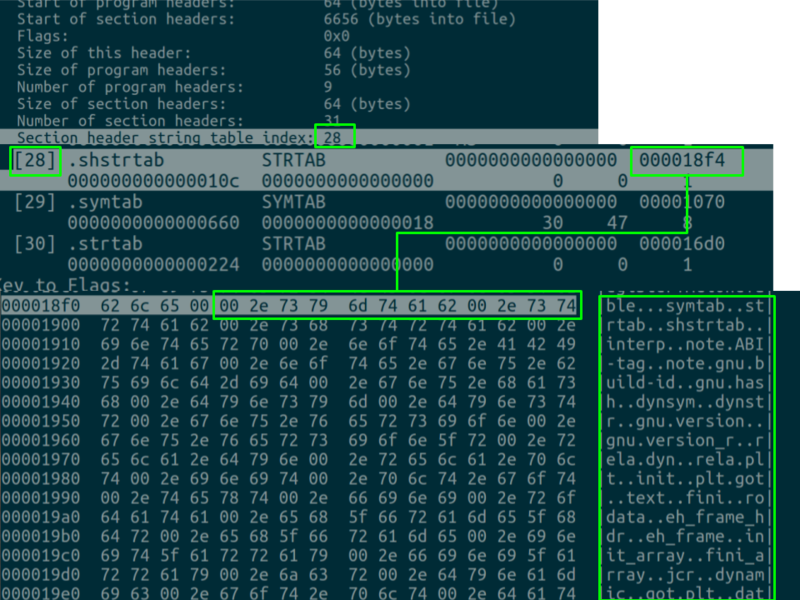 In the raw format, the 0x1b is the index in .shstrtab where the name of .interp is saved. We can now see that readelf actually fetches this for us and prints out the nice fancy name. We can move on to unpacking how the symbol and library resolution works. Stay Tuned!